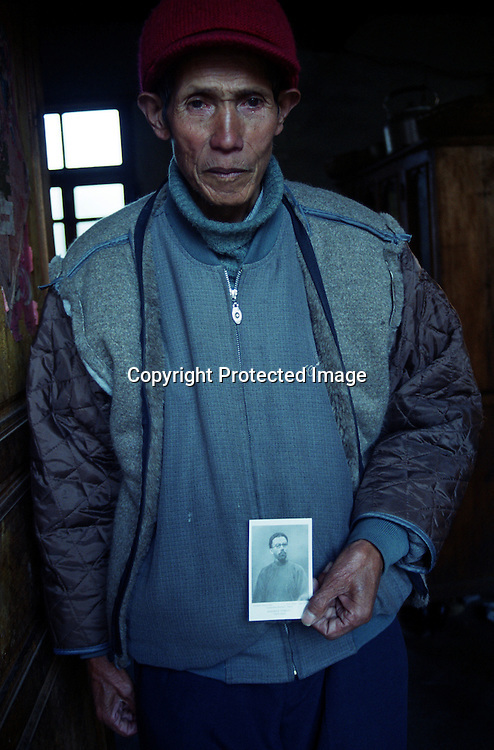 CIZHONG, DECEMBER 17, 2000: Bernard, 75, holds a picture of Maurice Tournay,one of the French missionaries who built the Catholic church in Cizhong at then end of the 19th century, Yunnan province , December 17, 2000. Bernard went to jail for 22 years after the foreign missionaries left Cizhong in 1952 for having assisted them . he passed away in 2003..The church in Cizhong is believed to be the real life model for James Hilton's famous novel " lost Horizon"- a description of Shangri-La-..Maurice Tournay is one of the catholic martyrs who were canonized by pope John Paul II on October 1, 2000.. .